People with coronary artery disease have an increased risk of death if they have fat around the waist, according to researchers in the US. The Mayo Clinic team, which analysed data from five studies involving 15,923 patients, found this even affected people with a normal Body Mass Index. In the Journal of the American College of Cardiology, they said people with waist fat should try to lose weight. 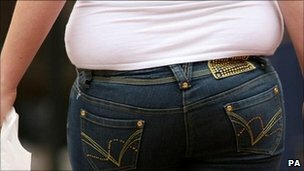 The British Heart Foundation said those with heart disease should be vigilant. The researchers at the Mayo Clinic looked at the distance around the hips and waist to measure the fat around the belly, and BMI which is a measure comparing height and weight. There was a 75% increased risk of death for patients with high levels of fat around the waist compared with those with thin waists. Even patients with a normal weight, a BMI between 20 and 25, had this increased risk of death if they were carrying fat around the waist. The researchers argue that doctors should take waist and hip measurements for all patients with coronary artery disease in order to give patients advice on how to reduce their risk. Dr Mike Knapton, associate medical director at the British Heart Foundation, said: “This study shows that abdominal obesity is the major risk factor for patients with coronary heart disease even if they have a normal BMI and are a healthy weight. “The study only looked at patients with coronary heart disease, but it confirms the idea that abdominal fat is ‘toxic’ and is associated with a number of other risk factors for the disease such as high blood pressure, high cholesterol and diabetes.